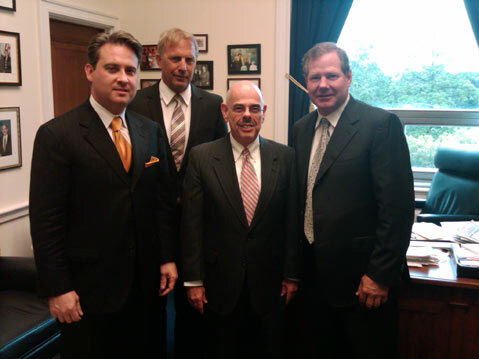 (left to right) John Houghtaling, Kevin Costner, Senator Henry Waxman, Patrick Smith. It’s like a disaster movie, featuring the greedy executives who let it happen, panicking politicians, and a champion. In the movie version of Deepwater Horizon, the champion might be played by, say, Kevin Costner, a veteran of the everyman hero role. However, it seems as though the barrier between the cinematic and real has been breached. The real Kevin Costner has stepped off the silver screen to become an unlikely hero of the Deepwater Horizon crisis in the Gulf of Mexico. Celebrity philanthropy is certainly nothing new, but Costner’s efforts go beyond bringing publicity and funds to the cause. In his role as the owner of Ocean Therapy Solutions (OTS), based in downtown Santa Barbara, Costner and his business partners Patrick N. Smith and John Houghtaling II, with help from UCLA engineering professor and researcher Eric M.V. Hoek, have provided cutting edge oil-treatment technology for the cleanup efforts. They developed a centrifuge capable of separating oil from water with what they claim is unprecedented efficiency, and it is quickly becoming one of the main tools in the Gulf cleanup effort. According to Smith, British Petroleum bought 32 of the machines in June, and the federal government is providing assistance to Gulf Coast communities that will enable them to buy their own centrifuges. 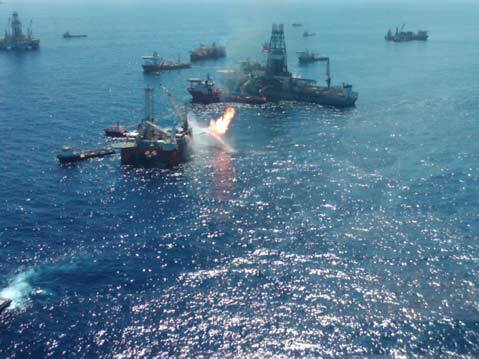 Although OTS was only conceived immediately following the oil spill, Costner’s involvement with developing this technology has spanned nearly two decades. According to Smith, Costner’s inspiration for developing oil-cleanup technology harkened back to his experience growing up in Ventura County and realizing how defenseless the coast was against oil rig spills. In 1993, he purchased a patent from the Department of Energy’s Idaho National Laboratory for a centrifuge to separate oil and water, and formed Costner Industries. He hired researchers, sunk $20 million of his own money into the company, and for 15 years strived to garner interest from oil companies. However, according to Smith, not only were the oil companies disinterested in the cleanup technology, but government agencies like the Environmental Protection Agency and the Coast Guard often blocked the technology from being tested because of concerns over water purity. The problem, Smith said, was that these agencies required the water being put back in after the centrifuge process to have the oil content of no more than 15 parts per million, a virtually untraceable level. 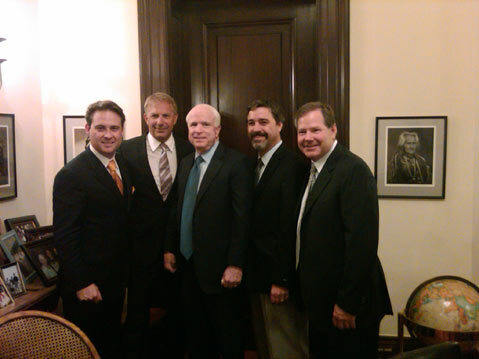 (left to right) John Houghtaling, Kevin Costner, John McCain, Andrew Quintero, Patrick Smith. However, as Hoek continued research on the machine, he improved the water purity to 99.9 percent. This, as Smith put it, “fortuitous” development occurred only a week before the spill. “Kevin had never given up,” Smith said, “and with my help, we were methodically going through the process of how to solve the EPA and the Coast Guard’s problem about being as pure as we could, so the whole thing was a coincidence of things just coming together.” Talk about a Hollywood ending! Smith said OTS has developed several applications for the centrifuge, allowing for cleanup not just in deep ocean, but also in waters as shallow as three feet. In addition, they are currently in the midst of getting approval for a “plume hunter.” The machine would make use of Norwegian technology that Smith compared to an “ultrasound” capable of seeking out the toxic plumes.